I’ve heard over and over from podcasts, watched countless videos and read numerous articles that emphasised the correlation between physical training and one’s approach to professional work, whether you’re an entrepreneur or you’re employed by someone else. I paid my first gym membership at the age of 16 and I’ve been working out since then. I realised early on in life the importance of not just being active but being disciplined with it. While I would have altered my days at the gym to work with other life priorities like family, university and my job, it’s always something that’s a part of my life. My workout sessions happen even while I’m out of the gym. I usually visualise the weights I would like to push or lift before I go to the gym and before I perform the exercise. This concept of visualising, believing then actualising is important in many others areas of my life especially as an entrepreneur. Training at the gym also helps me to come out of my comfort zone. For the most part of this year, I trained in my comfort zone and this was evident in the way I approached other areas of my life. I know I’m not really pushing myself with weights when I don’t feel the need to train with my belt. I decided that’s going to change for 2015. I’ll be trying a new workout routine that will definitely take me out of my comfort zone, is based around consistently training heavier and one that I’ve never done before. These are qualities that I definitely need to develop in my professional life as an entrepreneur. I need to operate outside of my comfort zone a bit more to build my confidence, I need to push myself to do more or constantly challenge myself by increasing the intensity of the work I do and I definitely need to try new things. There are many correlations between physical fitness and professional readiness and building qualities in one area will definitely have a positive effect on the other area. I’ve also recently started listening to Brandon Epstein’s podcast Entrepreneur Fitness to help me master this aspect of my life. Yesterday I listened to Episode 88 on The School of Greatness with Lewis Howes and Sports Psychologist and Author Jim Afremow, entitled “How to think, train and thrive like a champion”. This interview focused on the Champion’s mind and how athletes, entrepreneurs and everyday individuals can tap into the Champion’s mind and achieve that level of greatness. In the interview, I also discovered easy solutions for overcoming inner resistance and performance anxiety. In the interview, Jim spoke in detail about mental imagery/visualisation/actualisation, meditation and breathing. When he works with athletes, he gets them to visualise themselves doing the sport and achieving the desired outcome. It’s important to see yourself performing the act, feel yourself doing the act and do that as often as possible. Jim mentioned Mikaela Shiffrin when she won the olympic gold medal in skiing this year at the Sochi Olympics. She said at the Sochi press conference, “I’ve been here before in my head for sure, to everybody, this is my first Olympics. But to me it’s my thousandth”. This concept can be applied to entrepreneurs and everyday individuals when achieving goals. It’s good to also picture yourself dealing with all kinds of adversity and overcoming it, so that when it really happens, you’re more confident and you’re able to hand the situation. Jim also conducted a breathing exercise with Lewis where he inhaled for a count of 5, held that breath for a count of 2 and exhaled for a count of 8. Jim mentioned that one thing he noticed with athletes is that they don’t exhale properly and I’ve actually heard this from a friend of mine in the US military who does a lot of deep sea diving. It’s important to exhale as much of that carbon dioxide out of your body. The key when feeling stressed or pressured is to take a deep breath then exhale a little longer. Jim also quoted a Chinese proverb which I quite love, “If you know the art of breathing, you have the strength, courage and wisdom of ten tigers”. This podcast is definitely worth a listen and Jim’s book “The Champion’s Mind: How great athletes Think, Train and Thrive” will definitely be a read for me one day. Some of Jim Afremow inspirational quotes from the podcast include “New levels bring new devils”, “The body wins when the mind refuses to give in”, “The key to dealing with injuries is to make rehab your new sport until you get your game back” and “No one is positive all the time. The key is to be vitally engaged in life””. Also remember, Champions do not leave the mental game to chance and circumstance. I’ve been at the National Insurance Board of Trinidad and Tobago (NIBTT) since May of this year and the project I’m currently working on, is not one I’m passionate about but I come to work and do what I can. Yesterday I made a phone call to June Marcano, Project Analyst who works directly with the Executive Manager for Information Technology at NIBTT. I enquired about the possibility of NIBTT producing mobile applications as my passion is mobile application development. Sometimes in life we’re placed in situations that may not suit us perfectly and it may be easy to walk away but I know I’m here at this organisation for a purpose and I need to figure that out. I know the current position I hold is not for me, so I need to exhaust all my options and see how best I can add value to the organisation before I make the final decision to leave. I should have a conversation with the Executive Manager before the end of the week to discuss the possibility of such a project and I hope it’s a venture the company is ready and willing to embark upon and one that I can contribute significantly towards. Before the end of this week, this blog will be directed to http://nekellecelestine.com. The original intent for http://helpmelandthatjob.com has changed and so I think it would be most appropriate to use my personal URL for this blog’s content. There are plans for http://helpmelandthatjob.com which will be done on a phased basis over a period of about a year. Using http://nekellecelestine.com will allow me to be more free with my content and cover broader topic areas. I hope the general response from new content I will incorporate will be as well received as the content I currently post on http://helpmelandthatjob.com. At the moment, there is no content on http://nekellecelestine.com but that will soon change and I look forward to seeing how my plans will unfold. Yesterday was awesome. 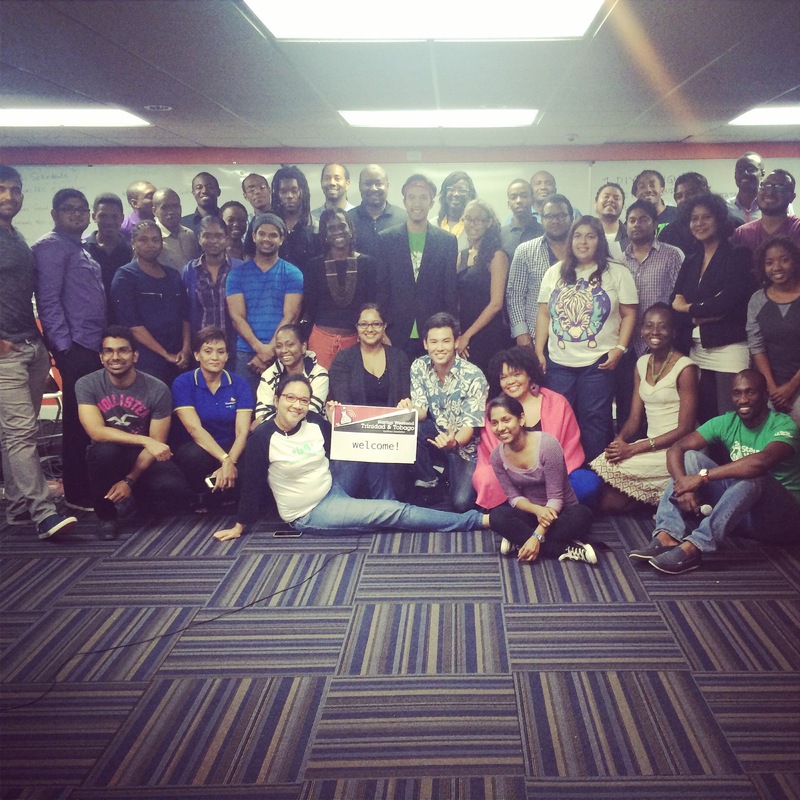 I attended the last day of Startup Weekend in Trinidad as a guest with my friend Ian Alleyne, who was one of the sponsors for the event and it was such an inspiring experience. The ideas presented by the teams were so innovative. In third place, was a group called Talk Down and their idea centered around providing a social media hotline for persons thinking about committing suicide or who have made attempts to take their lives, to talk to trained professionals about their situation. In second place was Peoples Holdings, a group focused on providing financial services at a higher interest on savings than the banks by focusing on investing in real estate. In first place was Smart Hook, a concept geared towards the oil and gas industry where an automated hooking system is used for lifting equipment. The current system in place uses human power and this has resulted in severe injuries and loss of life in some instances. At the end of the session, I took the opportunity to let the participants know how fortunate they were to have found such an event, as I walked this road alone for over a year and a half but now that I’ve found Startup Weekend, I’ll definitely be coming back. I also shared three valuable resources with all the aspiring entrepreneurs. I told them about John Lee Dumas and his Entrepreneur on Fire podcasts as well as his Quotes on Fire podcasts, these will definitely keep that entrepreneurial fire burning on a daily basis. I also told them about Lewis Howes, The School of Greatness. This guy is awesome and while his podcast format is different from Entrepreneur on Fire, it rocks just the same. Before the end of the night so many of them had already subscribed to all the podcasts. I would definitely be attending more of these events in Trinidad. As John Lee Dumas constantly reminds his listeners, “We are the average of the 5 people we spend the most time with”, so it’s very important that I spend my time with individuals who share my passions and some of my goals in life.